Synopsis (from Amazon): The New York Times bestseller A Long Walk to Water begins as two stories, told in alternating sections, about two eleven-year-olds in Sudan, a girl in 2008 and a boy in 1985. The girl, Nya, is fetching water from a pond that is two hours’ walk from her home: she makes two trips to the pond every day. The boy, Salva, becomes one of the "lost boys" of Sudan, refugees who cover the African continent on foot as they search for their families and for a safe place to stay. Enduring every hardship from loneliness to attack by armed rebels to contact with killer lions and crocodiles, Salva is a survivor, and his story goes on to intersect with Nya’s in an astonishing and moving way. 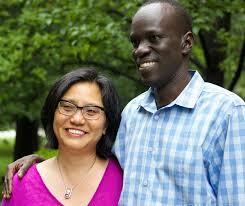 I had no idea that when Salva came to America, his American family lived in the area. He also went on to college and Monroe Community College. All of this was right under my nose and I didn't know about it. I then had a flash back to being a church and Salva talking to us about his story and his project, Water for South Sudan. I was even more in aww. This past year, my daughters needed a book to read for a school report. I suggested A Long Walk to Water. They loved it too. I have recommend the book to several others in the Rochester area and realized I needed to write a review and let others know what an amazing book it is and what things Salva is doing in Sudan. 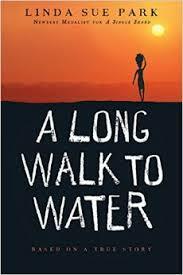 I recommend that everyone, regardless your age, to pick up a copy of A Long Walk to Water and recommend it to others. It is truly a wonderful read. Would I Read Other Books by the Author: Absolutely. I did know she also lived in Rochester. How did I not know this amazing author lived in my area. I really want to read A Single Shard and When My Name Was Keoko. Linda Sue Park is the author of the Newbery Medal book A Single Shard, many other novels, several picture books, and most recently a book of poetry: Tap Dancing on the Roof: Sijo (Poems). She lives in Rochester, New York, with her family, and is now a devoted fan of the New York Mets. For more infromation visit www.lspark.com. This book was great. It inspired me in many ways and taught me a lesson that friendship is valuable and you shouldn't take it for granted. Also, it taught me new language and vocabulary. And lastly, in general the book was just beautiful and great.